I wouldn’t expect anything less from Neiman Marcus when it comes to magical Christmas luxury gifts! Here is an AMAZING Edible Gingerbread House – Weighing in at a whopping 381 lbs of gourmet Gingerbread and measuring 6.6 feet high by 5.25 feet wide by 4.1 feet deep, this life-sized House of Delight features an amazing 517 lbs of royal icing, giant cookies, lollipops, gummies, mints, gumdrops and a sweet-encrusted roof, while inside you’ll find a lollipop tree “just for good measure”. 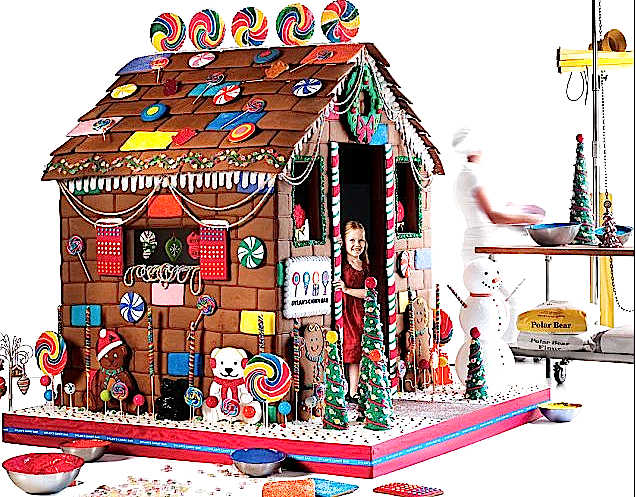 This stupendous Giant Gingerbread House is made by Dylan’s Candy Bar and Dylan Lauren is said to have found inspiration from the sweet movie Willy Wonka & The Chocolate Factory. Priced at only $15,000!